It is a great pleasure to welcome one of the most outstanding transport company Persada Travel & Tours to join us and provide online booking service for their bus ticket at BusOnlineTicket.com. Convenience at your fingertips is no longer just a phrase. Now, everyone can book Persada Travel & Tours bus ticket at anytime, any place and anywhere via BusOnlineTicket.com to enjoy the greater ease of online booking. Persada Travel & Tours is a popular bus company headquartered in Sungai Petani, Kedah. Persada Travel & Tours is well-known in providing bus services from Northern region to various locations such as bus from Parit Buntar to Kuala Lumpur, Hentian Duta, Shah Alam, Kajang, Klang, Malacca and Seremban. All the express buses deployed by Persada Travel & Tours are fully air-conditioned. They are also equipped with reclining seats and have spacious leg space to allow passengers to be seated comfortably during the journey. 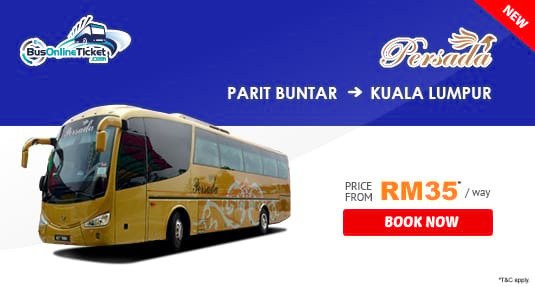 The most popular bus services provided by Persada Travel & Tours is bus from Parit Buntar to Kuala Lumpur. The boarding point in Parit Buntar is located at Hentian Raya Bus Terminal while the arrival point in Kuala Lumpur is either located at Terminal Bersepadu Selatan (TBS) or KL Sentral depending on your selection of arrival point. The bus fare is reasonably costs from RM35.00. It’s best to reserve your seat online as early as possible before leaving for your trip. Book your bus ticket from Parit Buntar to Kuala Lumpur at BusOnlineTicket.com and travel comfortably with Persada Travel & Tours. Instant email confirmation of your booking will be sent to you once the payment is received.